This is a quick step-by-step for adding a link to your signature, specifically a hyper-link, where you would have a specific word or phrase be the link to another part of the site, like your Condo thread. First, go to the page you'd like to link to. For this set of instructions, I'll use a Condo thread as an example. Be sure to go to page 1 of the thread. At the top of the page, you will see the URL. This will look like: http://www.bearvilleinsider.com/forum/blahblahblahelse . Left click anywhere in the URL. The entire address should now be highlighted. Be careful to not click anywhere else (if you do, you'll just need to re-highlight the URL). Right click in the highlighted address and select COPY from the drop down menu. Now, go to your User Control Panel. It is located in the second menu bar from the top, far left, User CP. Look down the menu on the far left for Settings & Options, and click Edit Signature. You may have up to 3 lines of text in your signature. Keep this in mind when designing it and planning what links you'd like to add. In the Edit Signature text box, type in the text you'd like use for your link. For our example, we'll use: Visit My Cub Condo! Left click in front of the 'V' and, while holding the mouse button down, drag the cursor to just after the '!'. The entire text should now be highlighted. Click on the icon above that looks like the earth. It is located in the second row from the top, 11th from the left, and if you place your cursor over it, a pop-up box will say "insert link". The box that pops up when you click that button will already have http:// in it. Delete that. Right click in the box and select PASTE from the drop-down menu. 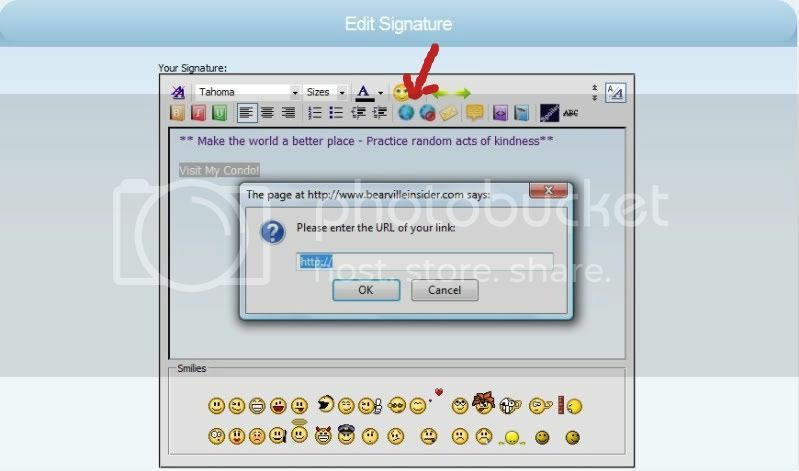 Click OK. Save your signature. Repeat the process to add additional links (but remember to save in between). ***Also, if you have questions or problems, let me know. I'm happy to help!! Avatar images can be 125 by 125 pixels or 48.8 KB (whichever is smaller). If your image is larger, it may be auto-formatted to fit, but if there is animation, it will be lost. To determine the size of your image, if you have it on your computer, right click and select properties from the drop-down menu. The size will be displayed there. **Be sure your avvie image is not a picture of yourself or shows your location!! From the User Control Panel, select Edit Avatar. If you have the image on your computer already, use Option 2: Upload from your Computer. Click the Browse button, and when you find the image, click OK. 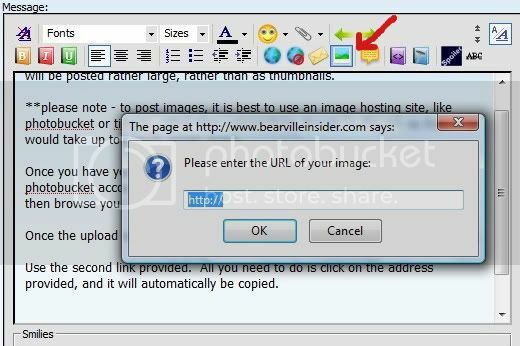 If your image is hosted elsewhere, like at photobucket, use Option 1: Enter the URL from another Website. Delete the http:// and paste the URL in its place. From photobucket, use the second link down, Direct Link. Most keyboards will have a button, usually in the upper right corner area, that says Prnt Scrn or something very similar. That's your print screen button, and its what you'll press to capture an image of your screen. From there, you'll need a program like Paint, Paintshop Pro, or a Photo Editor to paste it into. You'll want to open one of those programs, start a new file/sheet and right click anywhere on the blank page and select Paste from the drop-down menu. Do a file/save as and save your file. I usually save to a folder on my desktop reserved just for images so I can find them easily later for uploading. These instructions are for PhotoBucket.com, which is a free site to use. Images will be posted rather large, rather than as thumbnails. **please note - to post images, it is best to use an image hosting site, like photobucket or tinypic, rather than upload them directly to the site as that would take up too much server space. 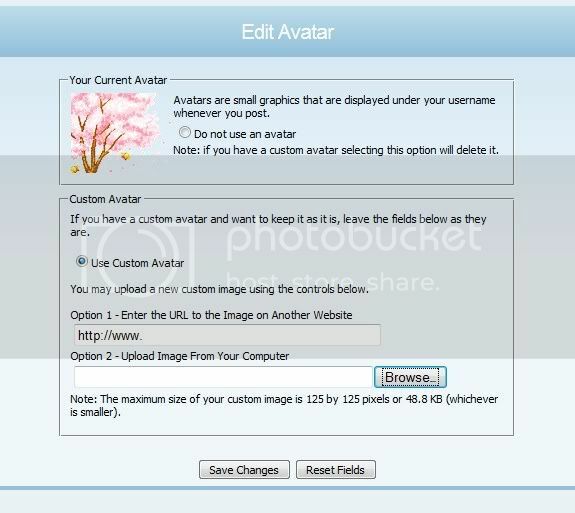 Once you have your image saved to your computer, and have created a photobucket account, simply log in to photobucket and use the Choose Files button, then browse your files and select the images to upload. Once the upload is complete, you can title and/or tag your images as desired. Use the second link provided. All you need to do is click on the address provided, and it will automatically be copied. Now, be sure that your cursor is where you want the image to be placed (inside the text box of your post). Click the Insert Image button (second row from top, 14th from left). Delete the http:// and paste the URL from photobucket in its place. Excellent guide. Thank you so much. Lol, you're welcome I'm happy to help. Good guide, pandy! Can I call you that? I'll say Angie! You did such a good job on this. Thank you so much.